Cedella Marley, the first-born of Bob and Rita Marley, will launch her cookbook later this year. KINGSTON – A new cookbook with delightful recipes using marijuana will hit the market soon. And it’s coming from daughter of late Jamaican and international reggae icon Bob Marley. 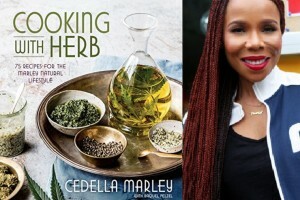 On July 25, Chief Executive Officer at Tuff Gong International Cedella Marley, the firstborn of Bob and Rita Marley, will launch her Cooking with Herb: 75 Recipes for the Marley Natural Lifestyle. It promises to show readers how they can experience the healing benefits of cannabis, “safely and pleasurably”. Marley guides readers on the questions they should ask at dispensaries, offers insights on today’s more potent weed, and demystifies the process behind controlling the dosage of cannabis in edibles. The 240-page book will feature a collection of more than 75 Caribbean-inflected, canna-boosted recipes. It also provides recipes for homemade scrubs and hair treatments. The book is expected to retail for just under US$30. Last February, the Marley Group of Companies, backed by a venture capital firm, licensed its name to create Marley Natural, a United States-based company that sells herb and accessories. Cedella’s brother, Ziggy, published his own cookbook last October while sibling, Damian, has launched his own cannabis line called Stony Hill.